The Ohio State University Center for Urban and Regional Analysis (CURA) is the hub for data-driven urban science and Geographic Information Systems (GIS) on campus. From analyzing mobility and accessibility within cities to understanding the social context of public health, CURA engages in a wide range of research activities. Throughout the academic year CURA hosts speakers and panel discussions to engage students, staff and faculty on urban issues relevant to Columbus and the rest of the world. By connecting multiple areas of scholarship on urban topics, CURA is a vital component of Ohio State University’s urban mission. We’re in the midst of a revolution in the human sciences, such as transportation, urban, public health and the social sciences. Widely available geospatial data and computational techniques are giving researchers unprecedented insights into people, cities and societies. CURA supports Ohio State’s urban mission by giving faculty and students access to cutting-edge capabilities and expertise in data-driven urban science and GIS." CURA’s mission is to serve as a bridge across academia, industry and the policy sector by providing spatial analysis of economic, social, environmental and health issues in urban and regional settings in Ohio and beyond. Students and faculty use CURA as a resource for mapping and spatial analysis projects, from doctoral dissertations to grant collaboration. The center connects a group of scholars in social, natural and environmental sciences; applied economics; agriculture; engineering; health and medical professions; and the humanities. A project funded by the Ohio Department of Transportation is investigating new methods estimating origin/destination flows within Ohio cities using archived travel data. If successful, the state could save millions of dollars by leveraging innovative data sources. CURA is developing spatial database query and mapping tools to explore and analyze social and neighborhood determinants of infant mortality rates in Ohio cities. The Infant Mortality Reduction Project is funded by the State of Ohio and in collaboration with faculty in the Department of Geography and the College of Public Health. CURA is creating an interactive web-mapping service to support vacant land banks in mid-sized cities across Ohio. This toolkit also supports field-based data collection by local officials. A Connect and Collaborate Grant from the Ohio State University Office of Outreach and Engagement supports this project. 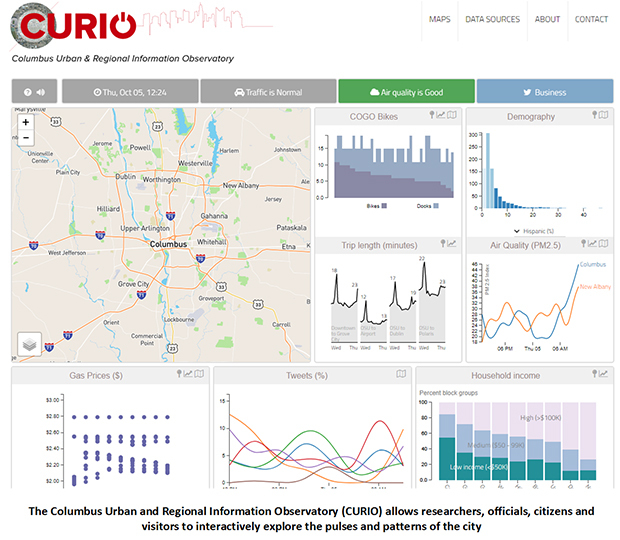 CURA is creating an online urban data dashboard for Columbus that will allow citizens, officials and visitors to get a sense of the pulse of the city by exploring and visualizing the linked mobility, economic, social and environmental dynamics. The College of Arts and Sciences supports this project. In collaboration with faculty in the Department of Computer Science and Engineering, CURA is deploying and testing a low cost sensor network that will allow transportation planners to count pedestrians and cyclists in addition to cars, providing support for better walkability and bicycle infrastructure planning in cities. A seed grant from the Ohio State University Translation Data Analytics Institute supports this research. Working with researchers in the College of Public Health, health care providers, city officials and community activists, CURA is analyzing access to opioid recovery treatment centers and assessing if spatial gaps in accessibility associate with overdoses and other bad outcomes from opioid addiction.